Almost immediately we find the grave of Martha Tatham (nee Bamford), with her husband Herbert. They spent the last years of their life together, in Graham Street where Herbert died — at Number 37 — in 1899. According to the gravestone Martha died on March 28th 1901, aged 68 … three days before the census for that year was taken. But when the census was taken, who was listed at 37 Graham Street? … Martha Tatham, aged 67, with other members of her family. She died on March 18th 1902. Close by the path, now on its back, is the once-upright stone of Thomas Ironmonger and his wife Mary. He was baptised in Castle Donington on January 17th 1821 and died just over 77 years later … the age at which his death was registered. But look closely at the stone. 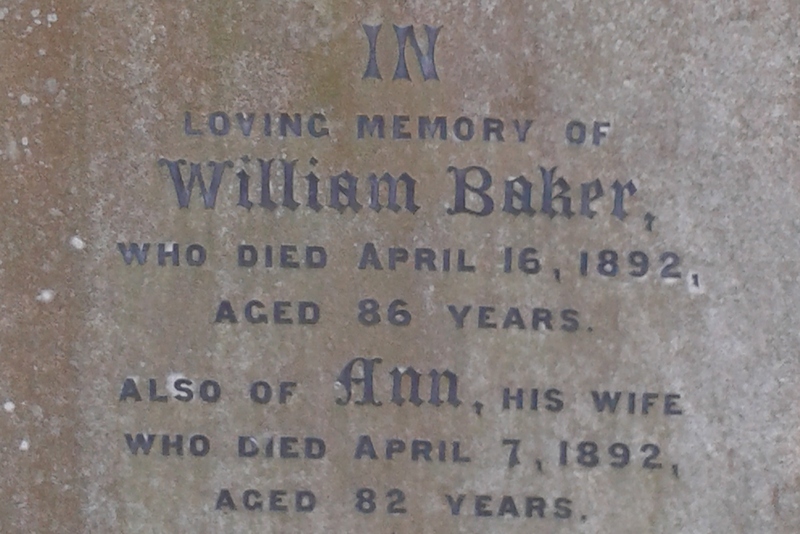 A short distance on is the grave of William and Ann Baker. Baptism records indicate that William was born in May 1806 at Shipley, son of John and Mary. I believe that his wife was Ann Heape of Newhall, daughter of James and Elizabeth, baptised on July 17th 1808, and who married William at Church Gresley on November 7th 1829. They both died in 1892, within a few days of each other, at 7 Slade Street, when William would be 85 and Ann would be 83. But look at their stone. 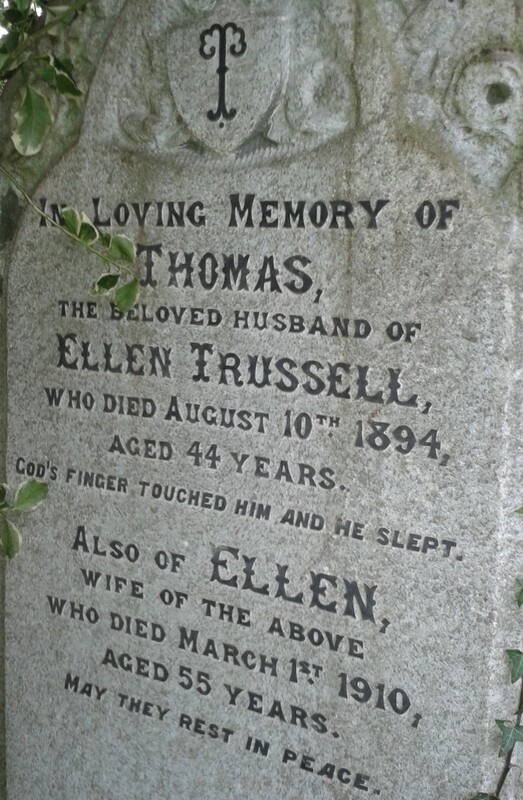 Some distance on and sheltered by an evergreen is a Trussell family grave. According to his baptism records (St Mary’s Church), Thomas Trussell was born in Ilkeston on January 7th 1851. He appears on the 1851 Census, taken on the night of March 30th, at Kensington, aged 3 months. 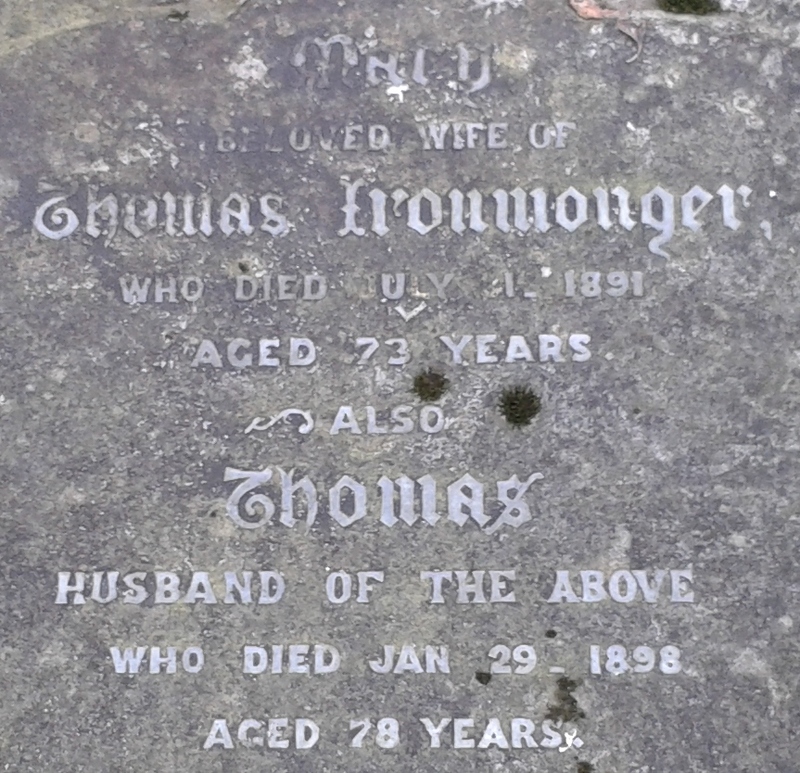 Thomas died on August 10th 1894 at a registered age of 43. But what is recorded on his gravestone ? Similarly Phillip Straw, living nearly all his adult life in Stanton Road, died there on May 10th 1891, and was buried there four days later … at a registered age of 81. But on his stone ? …. Joseph Bonsall was the second husband of Ann Beardsley and the couple married in September 1867. She was the elder daughter of collier John and Mary (nee Gregory) and was baptised at Ilkeston Wesleyan Chapel on October 17th 1819, when her birth date was recorded as September 23rd of that year. Ann died at the family home in Bath Cottages, Bath Street, on April 4th 1897 — five years after Joseph — and both her death registration and gravestone record her age as 76 … ? But was she? William West was born In Ilkeston in 1788, joined the 6th Regiment (Carabiniers) of the Dragoon Guards in 1806 and was discharged in 1830, having served all his army years ‘at home’. During that time he married Sarah Penman and their eldest daughter, Margaret, was born in Limerick, Ireland, on September 19th 1823 … as stated at her baptism at Ilkeston Wesleyan Methodist Chapel in June 1837. She lived with her father in Bath Street until he died in 1866 and thereafter traded as a draper in the same street. She died, a spinster, on April 1st 1892 … so how old was she then? Her gravestone — which is now guarded by holly and cloaked in ivy — agrees with her registered death age of 67. Doesn’t quite add up ?? 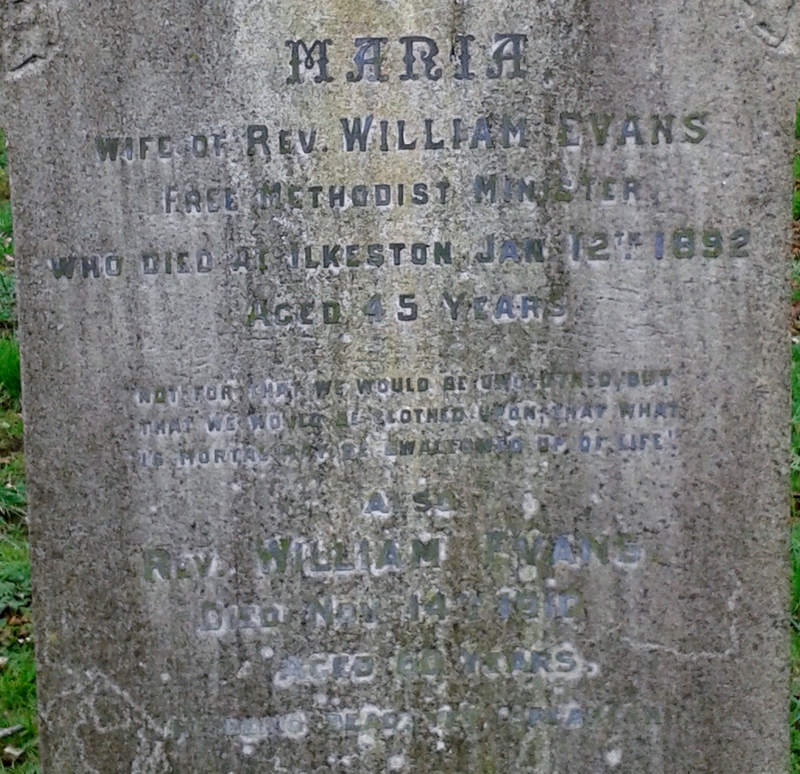 A little further along is the upright stone of William and Maria Evans. Born in Congleton, Cheshire in 1843, Maria Bittles married William Evans, also of Congleton, in May 1872 … guess where !! By 1891 William was a Minister at the Free Methodist Chapel in South Street, Ilkeston, and the couple were living at the Chapel House, 56 South Street. Maria died there on Tuesday evening, January 12th 1892. She had been ill for a fortnight with influenza, during which time pleurisy set in. On Monday she began to feel better but then took a turn for the worse and died at 8pm the next evening. She was buried on the following Saturday, the funeral procession starting at 3 o’clock from the Chapel Manse. Maria’s registered age at death matches the age displayed on her gravestone … but was it her true age ?? (She seems to have ‘lost’ a few years between the 1861 and 1871 censuses). Shortly after her buriel, husband William left Ilkeston and just over a year later married his second wife, Mary Boyd McCulloch. He took up a post at the Free Methodist Chapel in Belper, moved on to Tamworth, Staffordshire, and then Ashton under Lyne, Lancashire. He died there in 1910, his body returned to Ilkeston to be buried with his first wife. Although Mary Briggs was born in Leeds in 1868 and lived in Yorkshire until the turn of the century, she had strong familial connections with Ilkeston and its close area. Her father was Job Starbuck, born in Ilkeston in 1834, while her mother was Fanny (nee Thorley), born in Mapperley in 1838. Mary married Benjamin Briggs, son of James and Mary (nee Starbuck, her aunt) in 1907. The couple lived in Ash Street and were there when Benjamin was killed in an industrial accident. 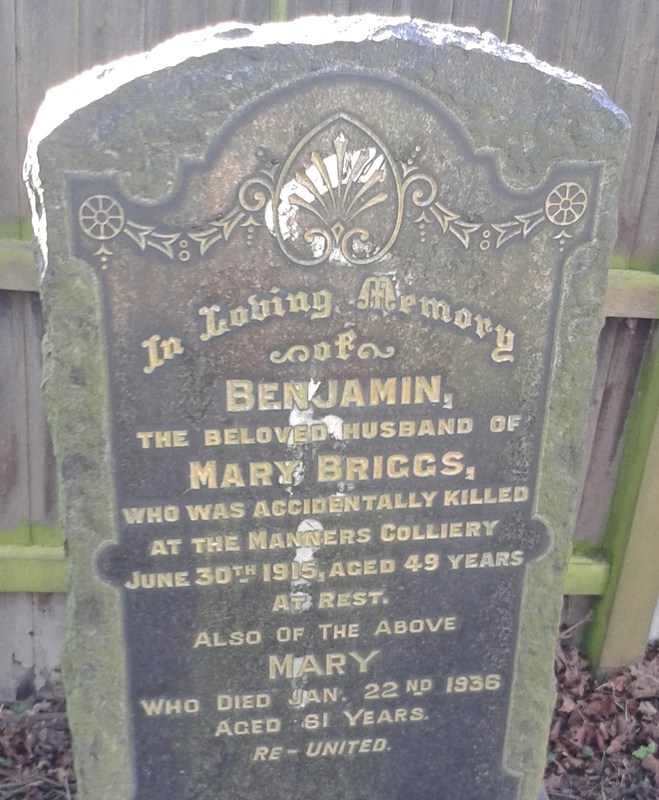 And when Mary was ‘re-united’ with Benjamin in 1936, her age was recorded as 61 … was she? As we stand looking at this grave, behind us is the area of the cemetery furthest from Stanton Road, beyond what was once the turning circle for hearses and horses conveying the coffins. Here there is a scattering of graves which we can examine. One of them contains the remains of George Youngman, born in Wells, Norfolk, and baptised there on April 25th 1811. 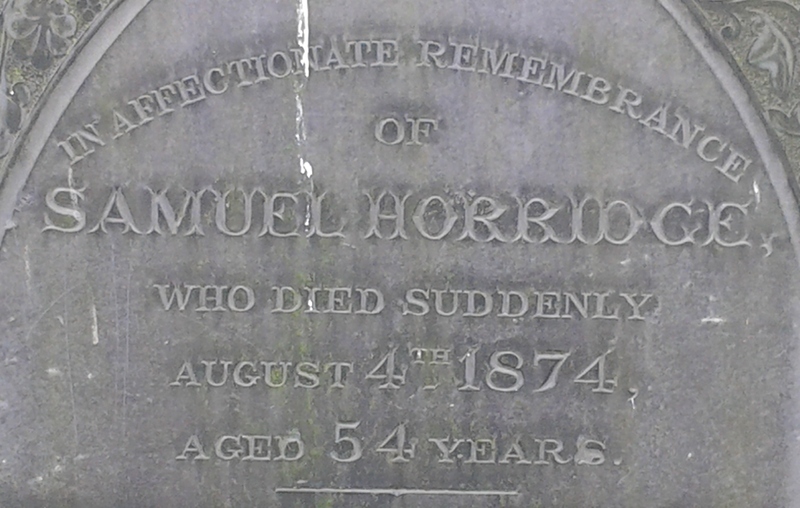 His stone is now badly worn but shows that he died on Christmas Day of 1866 … at the age of 54 ?? And close by is a stone remembering seven of the children of Amos and Sarah Beardsley, listed in chronological order of their death years (from 1864 to 1878). 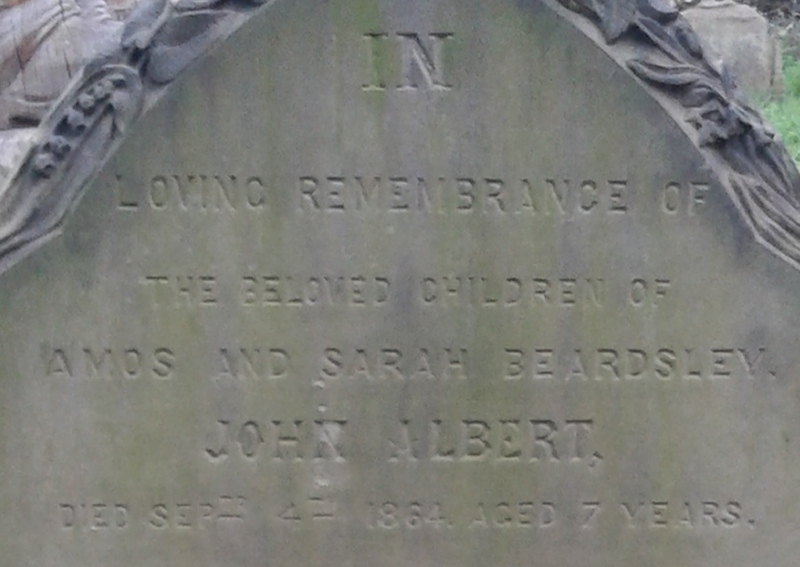 First on the list is son John Albert who was born on July 17th 1864 and died on September 4th 1864 — I calculate his age as 7 weeks. Now look at the stone. This error is surprising as the ages of the other children are very accurate. A mistake by the mason ?? The inscription is correct in that Samuel died suddenly while cutting the hedge around his garden … and apparently too suddenly to record the correct date of his death !! Samuel died on August 4th 1873 !! And finally, in the south-western corner of the cemetery and covered in evergreens, is the grave of William Phipps. 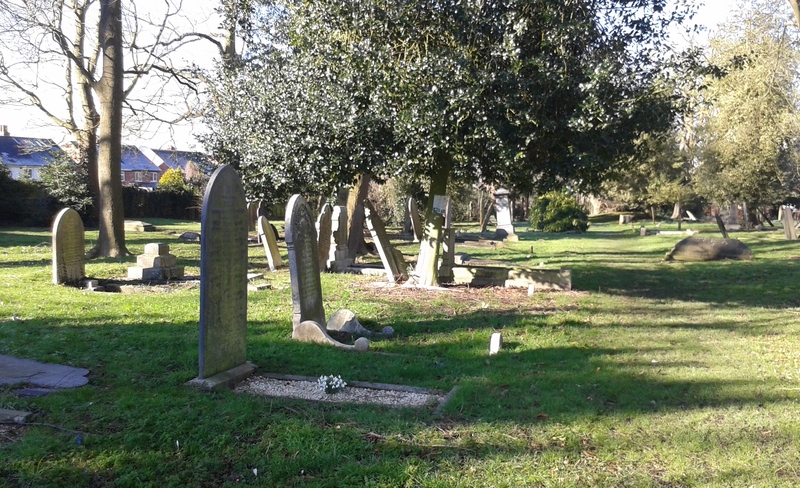 He spent the last years of his life, trading as a grocer at number 1 Awsworth Road and died there on April 12th 1890 … his gravestone tells us that he was aged 61. William was the son of Little Hallam labourer John and Mary (nee Beardsley) and was baptised at St. Mary’s Church, Ilkeston, on August 17th 1823 …. would he not be aged 66 at his death ? Now, leaving through the gates of the Cemetery, we turn down Stanton Road to visit the Wilkinson family.